The Castle of Montbrun stands on a site with more than 2.000 years of history behind. Remains of several ancient structures can still be seen on the domain. However, the first castle on the site was built by the knight Aimery Brun when he returned from the Second Crusade in 1178. The fortification was constructed on the orders of Henri II, King of England, to defend the borders of the Duchy of Aquitaine, which at that time was in his possession. This first fortress was called Trados after the old Roman name for the domain. All that remains of that structure is the high, square keep, topped with machicolations, parts of the curtain wall and a well. In 1199, during a siege of the nearby Castle Chalus, Richard the Lionhearted, King of England and Henri II's son, was wounded by a crossbow and died 12 days later, probably at Montbrun Castle. 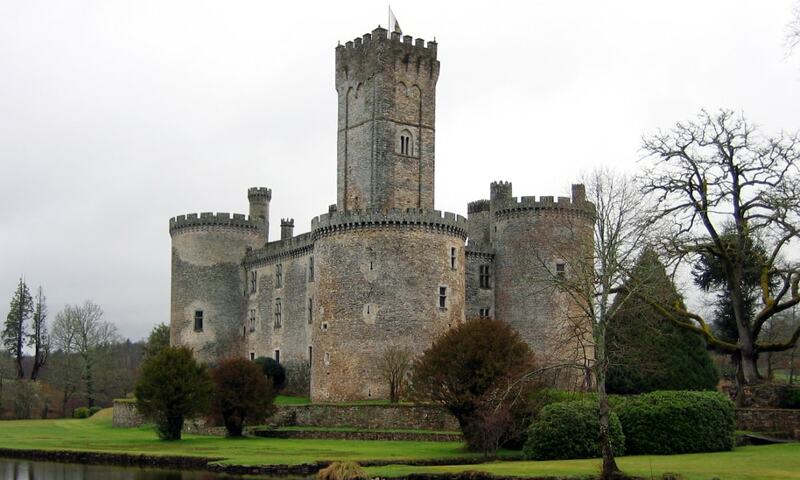 In 1366, the Brun family changed their name to Montbrun, hence the name of the castle today. They remained loyal to the English during the Hundred Years' War. The castle changed hands several times during the war and at the end of the century, it was partially destroyed by English forces. In the 1430s, the original square towers were replaced with round towers and the castle took on its present form. The castle was again damaged during the Wars of Religion by Protestant Huguenots. It was sold to the Lambertie family in the 17th century. Until the Revolution, it had been in the possession of several other families by marriage or inheritance. The edifice was pillaged and destroyed during the French Revolution and the archives were burned. The castle was restored by the de la Bonne family at the end of the 19th century but it suffered a serious fire during World War I. At the end of the 20th century, Maarten Lamers bought the property and restored the castle to its former splendor. It now includes 16 bedrooms, a library, a billiard room, 3 dining rooms and about 4.000 square meters of land. It is said that the property is (or was) for sale.